If you are tired of apartment blocks and villas in the cities, you might want to pay attention to detached houses in rural areas. Detached houses are getting popular among retirees and newly married couples. The size does not need to be big for them but just convenient to move around. If this sounds attractive to you, Migun Building Industry Company will be of help. The company is specialized in importing exterior materials and constructing movable detached houses and pensions. The company uses materials of high durability and thermal efficiency as well as eco-friendly materials from floor to roof. CEO Park jumped in the field of exterior materials in 2000 and studied in France to deepen his knowledge. He also completed a zinc master's course there. "My interest in exterior materials naturally led me to the interest in building houses in particular around the coastal areas as I liked sea activities very much. Unlike the inland, the houses around the coastal areas require materials that can endure the salt. Naturally, I focused on the materials with high durability" says Park. Many houses in Korea are notorious in terms of using cheap and harmful substances, bad insulations and poor soundproof. Knowing this very well, Park gave a thorough analysis on materials used overseas and adopted them in accordance with the Korean environment. For this reason, the materials used by Migun Building Industry Company are the best quality possible that has passed a number of tests. Also, the company maximized the visual charm of the houses by constantly paying attention to the current trend. 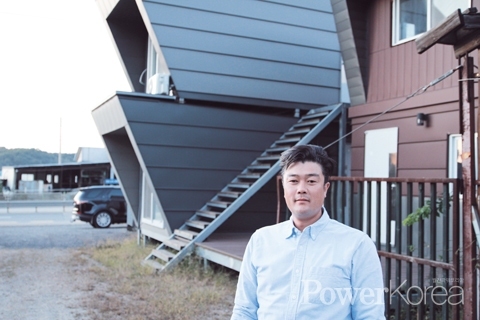 It is notable that the company recently has built a movable house on Ulleungdo Island. It was not an easy job considering the cost and technical difficulty but the specialists of the company brought up an idea to prepar the materials inland and assembled on the island; and the result was a great success. "Securing the sturdiness is most important when it comes to movable houses as they get twisted otherwise. Some people have this prejudice that movable houses are weak but they certainly will break that prejudice by checking out the movable houses made by Migun Building Industry Company." "The recommended models of Migun Building Industry Company are normally 19 square or 29 square meters big and the materials are zinc-based. This is because the weather in Korea varies significantly season by season unlike the west where wooden houses are more popular." When asked about future plan, CEO Park said with ambition that he and his excellent team would pioneer overseas markets with not only their innovative movable houses but also with ocean resorts.